Working with the architectural team at Iliadis & Associates, Mandurah Homes built this standout property and fulfilled the clients’ vision for a timeless, contemporary and functional family home. 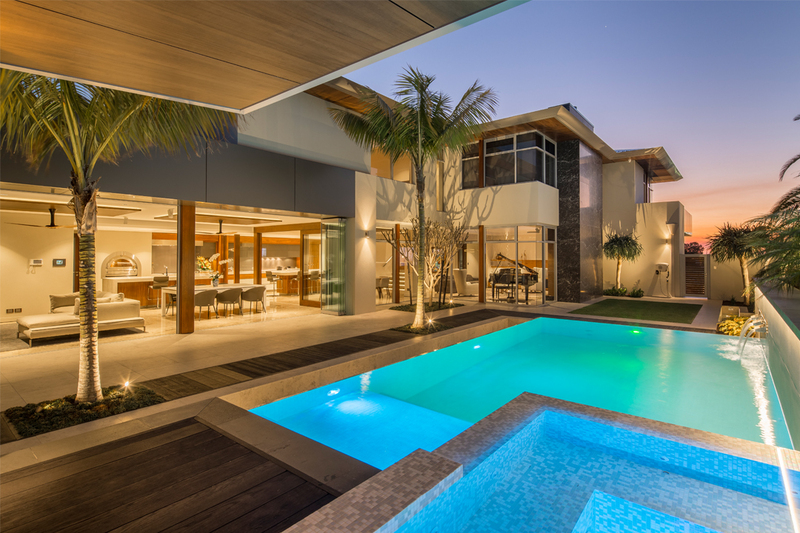 Located in the beachside suburb of Madora Bay, this stunning 846m² corner block home takes full advantage of its northern orientation to maximise solar gains, while providing protection from the summer sun with the incorporation of wide eaves along the exterior. Being situated close to the ocean, it was important to reduce the need for maintenance while retaining warmth and character. The clients’ request for an undercroft four-car garage was achieved by utilising the natural contours of the site, which provides a dramatic approach and grand entry into the house, with the ground floor rising above the street level. It was paramount to create a relationship between the indoor and outdoor areas. The covered alfresco – which includes an outdoor kitchen, family and dining area – is an extension of the main living zone. 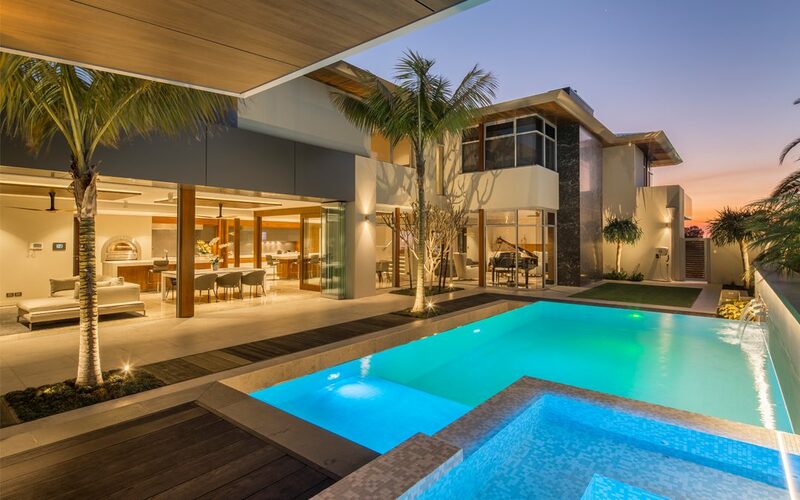 Frameless glass doors open from the lounge room to reveal a sparkling pool and landscaped garden, perfect for entertaining. The combination of materials, including timber and marble, gives the home a natural feel and, along with the northfacing floor-to-ceiling windows, creates an abundance of light. Allowing access to the upper level, the Brush box timber staircase features LED lighting and a custom-made polished stainless steel handrail. The upper floor boasts coveted park and ocean views, as well as views to the outdoor entertaining area. This also creates the opportunity for cross-ventilation through the home, allowing the homeowners to experience energy-saving benefits. Uncompromising on quality, each generously-sized bedroom has its own ensuite, and the main bedroom also comes equipped with a magnificent custom-made dressing room. 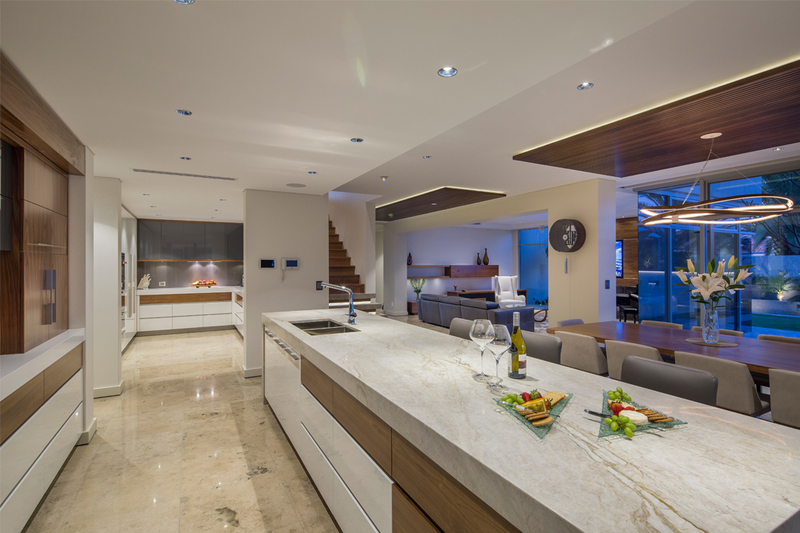 For the ultimate ease of living, the home embraces the latest in home technology, allowing the owners to control everything with the touch of a button. Mandurah Homes specialises in high-quality custom-built and architecturally-designed residential and commercial projects. 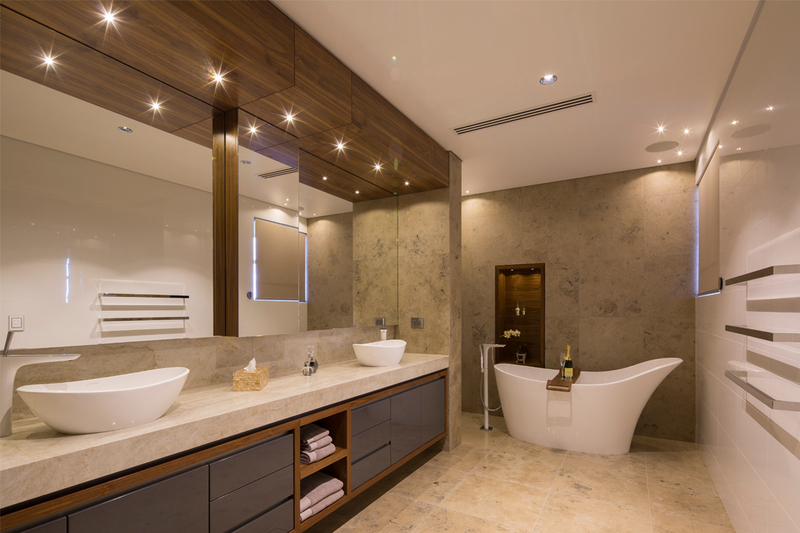 The team is experienced in projects ranging from small residential homes to multi-million dollar commercial ventures, and drives every project with the same level of commitment and superior quality finish.